Potions & Prams: No more plastic. After sorting out and bagging up yet another load of plastic toys that my four-year-old never plays with and carting them to the local charity shop, I've made a decision to try and not buy so much, well, crap. To be honest, it's also because I am just so over picking-up/sorting/tidying every teeny piece of plastic into the right set or trying to find a bare corner for another huge contraption that won't tuck neatly into the children's IKEA storage boxes we've just bought. I realise this just makes me sound like a weird, controlling mum but actually, when I think about it, it's the nicer, wooden stuff that Max tends to go back to again and again. His Batcave/Thomas Trackmaster/Spiderman bike have rarely been picked up since he got them at Christmas. So there you go. I'm having a plastics amnesty and anything that's barely been touched in the last year is going to (eventually) go. Of course I know Max's current obsession with anything superhero-related doesn't really fit my new aesthetic ideal - no-one does a beautifully painted, wooden Spiderman figure for instance. And things like Lego are always going to have a place in our home - and we all love a bit of Lego. However, I'm going to think more about what we do buy him; from the big stuff to those rubbish plastic toys stuck on the front of magazines which he loves getting - but invariably end up in the bin when they break hours later. And I already have a gorgeous Wendy House in my sights for Elsie. So here's a few of my favourite wooden toys that are genuinely loved by us all in the Rudolf household. 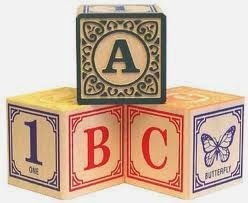 They tick all the right boxes in that, they're beautiful, well-made and most importantly, actually played with over and over again. 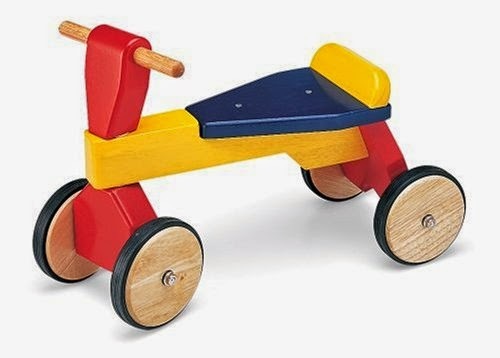 Max was given one similar to this as a baby and we still have it for when Elsie starts walking. It looks great and he loved stacking and playing with the blocks as well as practising his first steps. We 'borrowed' this bike from our neighbour after her little boy moved onto the balance bike and we could hardly get Max off it. In fact, he sometimes has a little ride around the garden on it even now. It's just lovely. 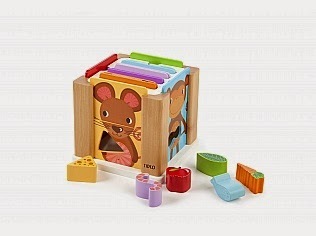 This is probably one of the sweetest little sorting blocks I've ever seen - and as well as sorting shapes, there are animal pictures to pair up too. We have one ready for when Elsie moves on from playing with spoons and plates. 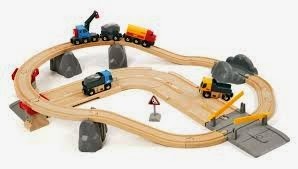 Ah, how I love Brio; Max and his daddy have spent hours (days even) putting together their little wooden rails, teeny trucks and bridges and have built up quite a collection. This stuff never gets old and lasts and lasts. Love. 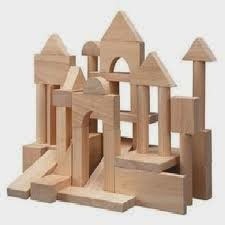 I've been meaning to get a set of these for aaaggges but in the meantime, we've been building towers with our Jenga blocks. 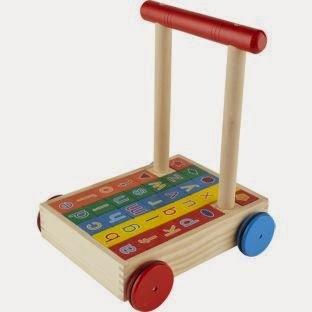 You can get loads of versions of these and Max loves playing with them at nursery - I think they're just one of those toys that kids never tire of.